3 Days from now Geek Girls will converge on Seattle. 3 Days to go until GeekGirlCon '12. 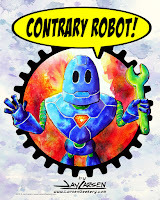 And this 5x7 mini will be keeping us honest in Booth 307, the LarsenGeekery Booth. Just in case you missed it. We are counting down the days until GeekGirlCon 12. That is an original mini masterpiece by Jay, featuring the lovely Wonder Woman herself. The whole LarsenGeekery Clan has been busy putting our best Geek Gear forward for you to enjoy and hopefully take home. We have handmade clothes, bags, purses, jewelry, art and comics. And we are looking forward to celebrating the best in Geekery with all the great people at GeekGirlCon 12 in Seattle this weekend. Saturday and Sunday. It's not to late to make plans. The Larsens will see you there!